The Aero Press is an aerial camera for 6x7 exposures, made by Linhof. Technically it is a relative of the Linhof Press 70 rigid-bodied press camera. It was a favourite aerial hand camera of the German Bundeswehr (unified military services). It uses Linhof Super Rollex or Cine Rollex 6x7 backs and interchangeable Zeiss lenses. The standard lens is an 80 mm f/2.8 Planar. Aero-Press outfit comprising camera, serial no. 1991057, Planar 80 mm f/2.8 and Sonnar 180 mm f/4.8 lenses, viewfinder and two Cine Rollex roll-film backs; the camera and case of this example are engraved with a Bundeswehr inventory number. 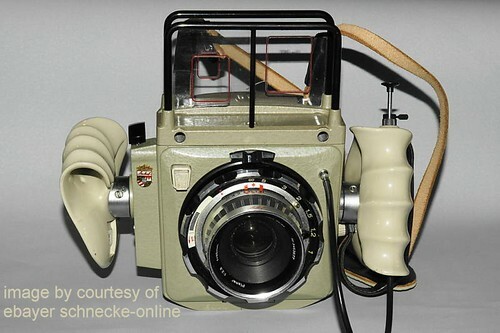 Sold at the fifth Westlicht Photographica Auction, on 29 May 2004. This page was last edited on 19 August 2013, at 15:33.